Online adventure: tradition meets tomorrow! 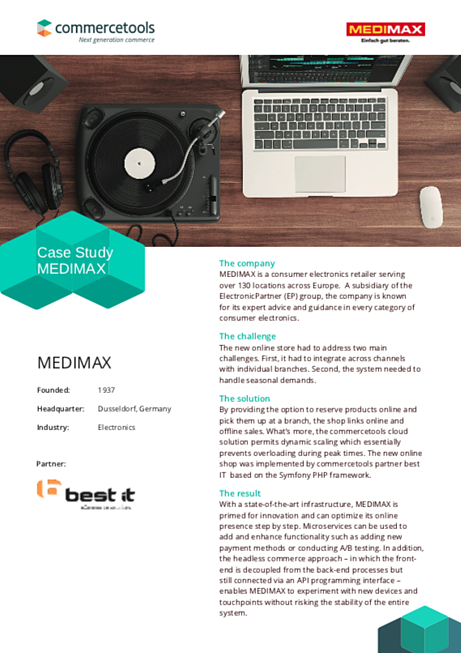 MEDIMAX is a consumer electronics retailer serving over 130 locations across Europe. A subsidiary of the ElectronicPartner (EP) group, the company is known for its expert advice and guidance in every category of consumer electronics. The new online store had to address two main challenges. First, it had to integrate across channels with individual branches. Second, the system needed to handle seasonal demands. Please fill out the form to receive your free copy of this case study!